A Toronto organization, which helps shelter dogs learn socially acceptable behaviours to increase their chances of getting adopted, is getting a helping hand from True Leaf Medicine. 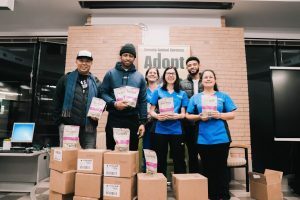 The hemp-based pet product manufacturer and its partner, creative agency Rozaay Management, have donated boxes of True Hemp chews to Second Chance Dogs in support of an adoption event held at Toronto Animal Services in North York, Ont. Professional football player Tevaun Smith and YouTube personality Julian Lloyd also attended the event to support the cause. “We are teaming up with a dedicated group of pet-loving athletes and influencers on a mission—to return the love to dogs and cats through our passion and products,” said Darcy Bomford, founder and chief executive officer of True Leaf. The companies are working to grow True Leaf’s Return the Love charitable program, which was launched last year. Through Return the Love, they have donated to St. John Ambulance and the BC Pets and Friends program to support volunteer therapy dog and handler teams and benefit the well-being of seniors in care throughout the province.